Michigan’s most visible sinkholes are along this 2½-mile trail that loops around five such depressions, some more than 100 feet deep. Gypsum deposits about 900 feet down that dissolve cause a collapse that creates sinkholes. 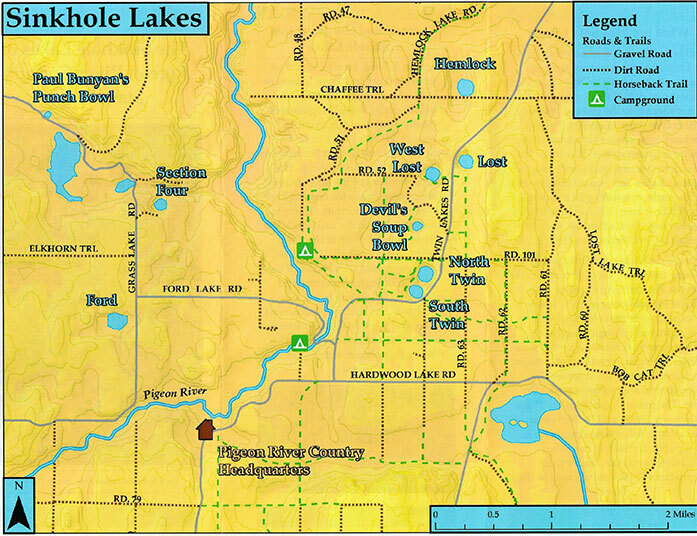 Those along the Sinkholes Pathway are dry, while others nearby, like Shoepac Lk and Tomahawk Lk, [also Ford (11’N 27’W) and Section 4 (11N 27W) Lks over on the Shingle Mill Pathway as well as others near them] are filled with water. Some 2,600 acres of sinkhole area around the Sinkholes Pathway are closed to all motorized vehicles, providing a setting of forest solitude. These sinkholes are part of a karst system extending eastward to Lake Huron.